When it comes to nutritional products like healthy drinks and food, it is always believed that they are best made by hand and handmade tools rather than machines those employing motors, blades made of metal and facilitating you get your job done faster. Unfortunately, for juicers this is not true as the essential components of the items might get lost in the very process of grinding, crushing, cutting and juicing in a machine. Breville approaches these problems with some novel ideas that help retain the goodness of handmade organic drinks and yet save you time. It introduces the combination of a blender and a juicer in one product that is launched as Juice Fountain Duo BJE820XL, which combines effectively the blended drinks with 100% pure juice. There are many other marvels that make it so special in its task. 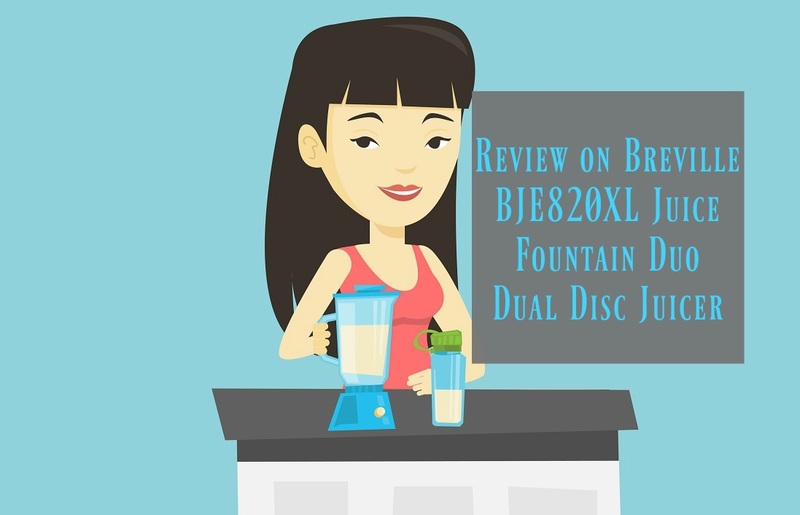 It is not a joke when Breville says that this hybrid is a duo and, above all, Breville BJE820XL Juice Fountain Duo gets its name from the dual x-factor that we just mentioned. It is garnered with the goodness of two appliances, a blender for smoothies from soft fruits and a juicer to extract 100% pure juice from fruits and even leafy vegetables. This is done at par with any other similar product in the market and you can see the results in its demo videos. √ The commercial quality juicer has two discs, one that remains intact for all juicing applications. There is a second disc that helps prepare puree and smoothies using the same machine, whatsoever. The discs are made of professional grade ultra-sharp titanium reinforced cutting blades surrounded with Italian micro fiber mesh that is certified for use in food preparation. This gives you 30% more juice and 40% more vitamins and minerals as compared to others in the market. The final product is pulpier and rich in fiber compared to traditional juicers and the ejected pulp is also drier indicating the efficiency of the extractors. The other essential selling factors are the width and breadth of its containers, that is, the pulp container, the juice bag and the feed chute. These three are supposedly the most crucial parts of any juicer or blender and are the first preferences of customers. The pulp container is perhaps the largest with a capacity of 3 L (XL size as per market) and a 3.2 qt volume. This maximizes the holding capacity for enough juice for the entire family at one time. This is complemented with a juice bag of 1.1qt with holding capacity of 1 L along with the froth separator attached to it. The feed chute is also an extra-large 3 inches (7.6 cm) wide feeding tube that can take whole fruits and leafy vegetables at one. It reduces your prep time and utilizes it in the proper juicing of the items, instead. This is also the “patented” form factor which can process a whole fruit at once. These containers fulfill the expectations of an XL sized juicer and blender combined into just one machine. These are also additionally available for purchase listed in the “Accessories” section in their website. This is something that home appliances care the most since the simpler it is to operate a machine, the more popular it will be in due course of time. Breville BJE820XL Juice Fountain Duo is an outstanding appliance in that respect as it utilizes the modern graphical feedback system for guiding users towards various controls. The device is more than just a rotating set of blades that crushes away anything that comes in its way. It also takes care about the user that is operating the machine. The first commendable feature is the set of controls with a 5-speed variable regulator that increases the rotation speed of the blades from 6500 rpm to an incredible 35000 rpm. These speeds are corresponding to various fruits and vegetables that are well labeled in its manual and recipe book. It has a bright backlit LED lit feedback to guide you through the required speed level with fruit graphics. This makes it easy to identify and understand even in dingy kitchens. This also adds to the visual appeal of the device, adding a more modern touch to the exterior. The user manual and the recipe book is a comprehensive guide to using the product for various juicing and pureeing applications. The guide also entails the ways to keep it clean, especially the filters and discs in order to retain their quality and increase their lifetime. It comes with a limited 1 year international warranty, out of the box. The product has been designed in Australia confirming to all norms, restrictions and strict guidelines for home appliances. Special care has also been taken for implementing safety mechanisms like the safety lock. This helps prevent accidental operations of the appliance in unsuitable conditions like open covers, improper disc alignment etc. The unit also offers additional accessories and parts that can be purchased at additional expense. These include juice bag with froth separator, pulp container, easy clean brush, food pusher, disc for soft fruity purees and smoothies, Nutri disk for all kinds of juicing applications, juice collector and top cover. There are a number of things that make it suitable for your kitchen including the technical specifications and the user friendly design. The aesthetic beauty is at par with most other appliances as the silver finish complements well with any background, whether light or dark. Overall, the Breville BJE820XL Juice Fountain Duo Dual Disc Juicer is one of the most popular kitchen appliances and has the potential of truly being called as a nutritional system. The dual disc takes care of the perfect blend of juice and puree that is rich in minerals and ads to your required vitamins for daily needs. It can take care of the entire family in one go with a much wider feed chute, juice container, juice bag and pulp container. Safety lock, variable speed regulator and backlit feedback with fruit graphics makes it a wonderful juicing experience.